If you care about the security of your online communication then you should take a look to Bitmessage, a simple and effective solution to encrypt your messages. This article explain what Bitmessage is, how it works and how to get started. In a nutshell, Bitmessage is an communication protocol that can be used to send encrypted messages from one person to another. The protocol uses strong encryption and P2P networks to mix messages and hide user identity. The communication is decentralized and trustless, meaning that it does not need any trust entities like root certificate authorities. When you start a Bitmessage application (also called “client”), it connects to the Bitmessage P2P network and downloads a list of known connection nodes. Then, the application starts receiving messages from other persons in the network, broadcasts and public encryption keys. The main idea is to make to make sure that everyone in the network has access to the same data. When you send a new message, it is encrypted with the messages from other users and the resulted data is replicated to the known nodes. Every time the application receives new data it verifies if it contains a message bound to you and shows it in your inbox. The communication uses private anonymous P2P network. The messages of a user are encrypted with the messages of other users, making difficult to track the originator computer of a certain message. It uses strong encryption with the use of randomly generated addresses. It uses public key cryptography such that only the recipient of the message can decrypt it. Outgoing message do not contain the recipient address. Thus, every network user tries to decrypt all passing messages, but it only succeeds those that are addressed to him. The network nodes store the encrypted messages for only two days before erasing them. It uses a proof-of-work (POW) system to protect from flooding. In order to start using Bitmessage you need to install the Windows or Mac OS client that you may download from the Bitmessage official site. After install, go to the “Your Identities” tab and click “New”. A popup will be shown with two options: the first one allows you to use a random number generator and the second one to uses a passphrase to setup the addresses. If you plan to use these identities on another installation of BitMmessage then go for passphrase, but be aware of the security implications. If you choose a common word or phrase, someone can likely generate the same address. Next, you should make sure you save the passphrase somewhere safe. There is no way to recover it. Proceed to “Send” tab to compose your first message. There is also a web alternative that you may use without installing the desktop app or you may use on your mobile device (Android, iPhone/iPad). 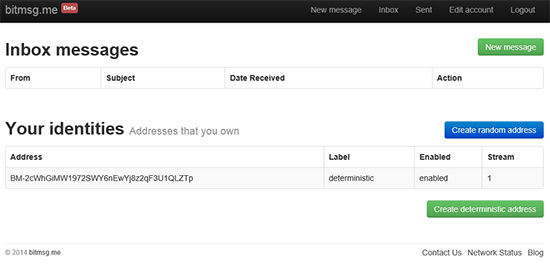 It is called bitmsg.me and it offers the basic sending and receiving functionality. Do you have questions about BitMessage? Bitmessage is relatively young and there is still work to do to make it more user-friendly. If you have any concerns or even suggestions on improvements take a look to the BitMessage forum over at BitMessage.org. There is also a Bitmessage subreddit that offers answers to a lot fo questions regarding Bitmessage usage. Bitmessage is not the only messaging service (take a look to this comparison list), but it is probably one of the most secure and complete solution. So far there is no sign that the encryption mechanism can be broken, thus you may use it with confidence. Enjoy!